On a warm sunny day, a glass of coconut water can instantly cheer you up. The delicate sweetness and fresh taste makes it the perfect way to escape the heat. But calling coconut water a refreshing drink is a bit of an understatement. It is a lot more than just a dose electrolytes and sugar. What are the great health benefits of this nature's very own sweet nectar? Let's find out. Are you suffering with indigestion or acid reflux? Coconut water's rich fibre content and natural enzymes can help you get back on your feet. There is also lot of talk about coconut water being able to cure more serious illnesses such as Crohn's disease. Coconut water is said to be identical to human plasma and can be injected directly into the blood stream. It is known that coconut water was used as a replacement to saline solution for soldiers during World War 2. 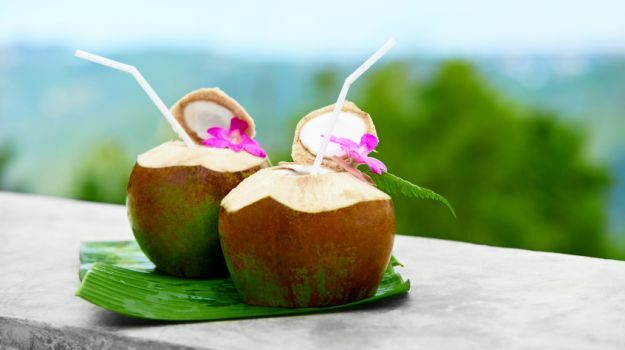 The blessed sweet water of coconut has cytokinins in it, which is a well-known anti-ageing agent. Besides this, it also hydrates your skin to make it more radiant and firm. Coconut water has a better concentration of minerals than fruit juices. Studies have shown that fruit juices may give a sudden sugar rush. Coconut water is lower in calories and has much less sugar than some fruit juices. Coconut water helps in boosting your metabolism. The higher the metabolic rate, the more fat you burn. Another plus point is that even though coconut water has a very low concentration of carbohydrates, it still gives you a feeling of being full. A perfect drink to lose weight. Do you have low blood pressure? Keep calm and drink coconut water. It contains magnesium and potassium that help in maintaining healthy heart functions. As an added benefit, coconut water reduces the risk of heart attack and heart strokes. Coconut water has anti-viral and anti-bacterial properties and can strengthen your body's immune system. Coconut water works like a charm against acne and other skin blemishes. It can also be used as a cure for eczema. Apply coconut over the affected area and leave it overnight. As a bonus, coconut water also tones your skin. Coconut water promotes hair growth and is effective against dandruff and lice. It can penetrate into your hair shaft, moisturizes it and gives it a healthy shine. Last but not the least, coconut water is a great home remedy to cure a morning hangover. Coconut water contains anti-oxidants and electrolytes which help in treating hangovers. There is a lot more that coconut water has to offer. If you know of any other health benefits, share it with us.